TB6612FNG_2pin.h requires two PWM signals per motor. On microprocessors such as the ATMega168 this will mean that the driver will use up Timer 0 and Timer 2. So it really eats into your available timers. TB6612FNG_3pin.h only requires one PWM signal per motor but requires two digital output pins per motor as well. The 'STBY' pin can be connected to a digital output pin to put the device into 'stand by' mode. I don't support this directly in the library but if you wish to add to utilise this feature then connect it to any output pin and pull the pin low to put the device into standby or high to enable the device. Whether you are using the 2pin or 3pin the remaining code remains the same. You can use act_SetSpeed to set the speed of the motor. MAKE_TOSHIBA_TB6612FNG_MOTOR_3pin - Create a motor using the 3 pin connection method. MAKE_TOSHIBA_TB6612FNG_3pin_MOTOR_DRIVER - Create the driver to control a list of 3 pin motors. toshibaTB6612FNG_3pin_Init - Initialise the 3 pin driver to use the given PWM frequency. MAKE_TOSHIBA_TB6612FNG_MOTOR_2pin - Create a motor using the 2 pin connection method. 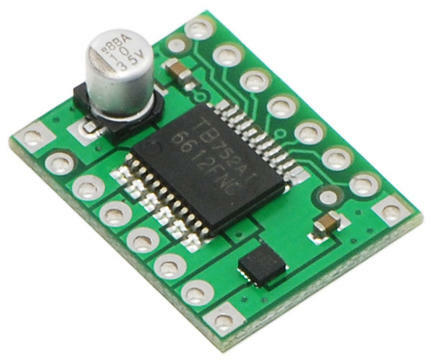 MAKE_TOSHIBA_TB6612FNG_2pin_MOTOR_DRIVER - Create the driver to control a list of 2 pin motors. toshibaTB6612FNG_2pin_Init - Initialise the 2 pin driver to use the specified PWM frequency. Create a motor using the 3 pin connection method. The first pin must be a PWM output pin, whereas the remaining two pins can be any output pins. If this is being used to control motor 1 then E3 is connected to PWMA, F0 is connected to AIN1, F1 is connected to AIN2. For motor2 then E3 is connected to PWMB, F0 is connected to BIN1, F1 is connected to BIN2. Create the driver to control a list of 3 pin motors. Initialise the 3 pin driver to use the given PWM frequency. This should be called in appInitHardware. Create a motor using the 2 pin connection method. Both pins must be PWM output pins or else the library will generate a runtime error. Create the driver to control a list of 2 pin motors. Initialise the 2 pin driver to use the specified PWM frequency.